ÂÂÂ What are the advantages of using FlexBind®ÂÂÂ pages? FlexBind® digital pages transform printed material into incredibly high quality, professional bound volumes for wedding, sports, travel albums and other digital scrap-booking uses. 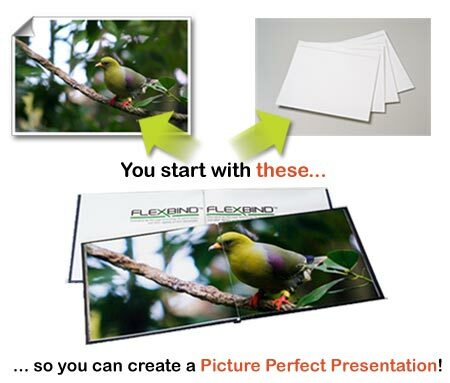 I have seen some other papers that claim to lay flat/panoramic, so what is the difference with FlexBind® pages? No machines to buy, no extra time to make, and you can offer all popular sizes up to 12 x 12, including the most popular sizes like 11 x 8.5 landscape. Fastbind Perfect Binder Secura, Elite Elite XT or PUREVA XT!